Overview... a progressive woman living in an unprogressive world. As the daughter of a Jewish moneylender in twelfth-century England, Rebecca has endured constant prejudice against her and her Jewish heritage. But despite the challenges she's faced all her life, Rebecca has refused to become vengeful or cruel. 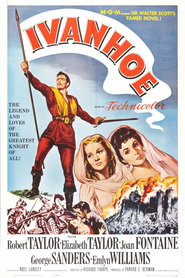 When Wilfred of Ivanhoe is injured in a tourney, it is Rebecca who – despite their religious differences – offers to nurse the knight, whom she quickly finds herself falling for. Personality... intelligent, brave, and kind. Rebecca might be an outsider, but she refuses to let that inhibit her. Despite being a Jew and a woman, she studies medicine and dedicates herself to helping the less fortunate. Dignified and beautiful, Rebecca would be a perfect match for Ivanhoe – if he weren't already taken and Rebecca wasn't so devoted to her religion. Rebecca's popularity ranking on CharacTour is #2808 out of 5,000+ characters. See our top-ranked characters and read their profiles.